BANGKOK, Thailand, December 23, 2011 (ENS) – Wildlife crime networks in Asia have been hit by a police operation against the illegal trade in endangered species coordinated by Interpol as part of a strengthened enforcement regime. During the first two weeks of December, police conducted raids and investigations and made arrests across the region. Supported by Operation Stocktake, Interpol’s Environmental Crime Programme, enforcement agencies from India, Indonesia, Malaysia and Thailand inspected markets, restaurants and shops to identify those selling and trading endangered wildlife alongside legal products. They also were on the lookout for the sale of wildlife meat, or bushmeat, for human consumption. India’s Wildlife Crime Control Bureau carried out searches in 37 shops and arrested 10 suspects, who now face criminal proceedings for trading items such as ivory and leopard claws. A number of birds were recovered as evidence along with marine animals such as sea cucumbers and shells. Officers from the Specialized Crime Department of Indonesia National Police coordinated the operation from Jakarta. East Kalimantan Regional Police arrested four suspects believed to be responsible for the killing of orangutans. They recovered firearms and what are believed to be orangutan bones. 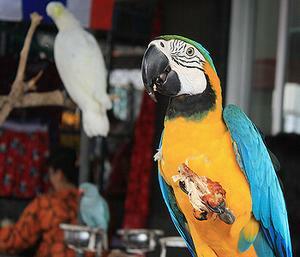 In Malaysia, officers from the Department of Wildlife and National Parks inspected 21 shops and restaurants. As a result, four persons are facing charges for possession of protected species. One restaurant was caught selling porcupine, civet and wild boar meat. Officers from the Thailand Police Natural Resources and Environmental Crime Division focused their efforts on Bangkok’s Chatuchak Market, the largest market in Thailand and a known hub for illegal wildlife trafficking. Investigators are developing and studying intelligence gathered during the operation and investigations continue. All four countries involved in Operation Stocktake uncovered evidence of transnational crimes and are working with Interpol to pursue international leads. 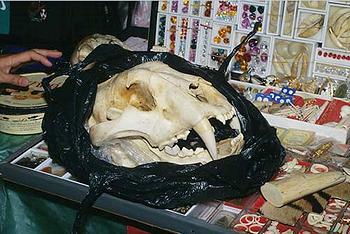 Justin Gosling, Interpol’s Wildlife Crime Officer in Bangkok, said that Operation Stocktake was a strong beginning to a series of actions targeting regional wildlife markets which are not only a threat to wild species and their welfare, but also represent a danger to public health through the potential spread of zoonoses, diseases that spread from animals to humans. In other Interpol activity, 50 representatives from customs, police, prosecution and specialized agencies from 18 countries across Africa and Asia attended the first international workshop to establish a network of controlled delivery units for forest and wildlife law enforcement. Controlled deliveries have been a tool for investigating drug and tobacco smuggling, but their use in wildlife smuggling is more recent. Allowing controlled deliveries enables enforcement agencies to monitor the supply of contraband wildlife and wildlife products to manufacturers, retailers or individuals. The interception of smuggled wildlife and wildlife products, prevents illegal goods from reaching consumers or black markets, Interpol officials explained. But interception often leads only to the arrest of “mules” or couriers and seldom to the arrest and conviction of the criminals who direct and organize the smuggling. By allowing the contraband to be delivered in a “controlled” manner, authorities can gather evidence at each point in the chain and, eventually, identify, arrest, and prosecute the ringleaders. Workshop participants agreed on ways to address the legislative, capacity and operational aspects of controlled deliveries. Supported by Interpol, the December 7-9 workshop was organized by the World Customs Organization under the auspices of the ?newly-formed International Consortium on Combating Wildlife Crime. It was hosted by China Customs at the Shanghai Customs College, a designated WCO regional training center. “The use of this enforcement technique will yield real results in bringing to justice those individuals who organize the smuggling of wildlife,” said participant John Scanlon, secretary-general of the Convention on International Trade in Endangered Species, CITES. On Wednesday, a kick-off meeting of China’s National Inter-Agencies CITES Enforcement Coordination Group, NICECG, was held in Beijing to enhance efforts by China’s government agencies to combat smuggling and illegal wildlife trade in China. The meeting marked the formal establishment of the NICICG, and included high-level representatives from CITES and more than 15 Chinese agencies, including Customs, Agriculture, Industry and Business Administration, Public Security, and the Forest Police Bureau and Conservation Department of State Forestry Administration, SFA. “The demand for wild animals and plants for traditional Chinese medicine and food is stimulating illegal trade and overexploitation of wildlife,” said Yin Hong, the vice minister of SFA, who chairs the NICECG. “With the establishment of the Coordination Group, we can enhance exchange and sharing of information, integrate and co-ordinate respective efforts and design and carry out joint enforcement actions to implement CITES better in China,” she said. Liaison agencies also participated, including Ministry of Foreign Affairs, State Tourism Administration, Supreme People’s Court, Supreme People’s Procuratorate, National Development and Reform Commission, and Animal and Plant Inspection and Quarantine Administration. “Only through inter-agency co-operation and collaboration can we solve the problems facing us in enforcing CITES and in addressing illegal trade in wildlife,” said Dr. Meng Xianlin, executive deputy director-general of China’s CITES Management Authority. The meeting reviewed the progress of CITES-related law enforcement in China during the past three decades, analyzed the challenges and problems facing wildlife law enforcement in the country, and planned major activities for the next 12 months. “TRAFFIC has worked with these very agencies for the past decade and applauds the establishment of such a joint mechanism for CITES enforcement in China,” said Dr. Jianbin Shi, who heads the China program of the wildlife traffic monitoring network TRAFFIC.